Today in geek news: Simon Pegg and Nick Frost promote their upcoming movie in the most awesome way imaginable, THQ’s Homefront gives us another reason to be afraid and Toronto based writer JM Frey is giving away a preview of her book, one sentence at a time. I’m not ashamed to admit that if I ever meet Simon Pegg, I will probably go fanboy in about eight to fifteen seconds. As both a writer and an actor, the man is just fantastic. Granted Run, Fatboy, Run might not have been his finest hour. However, all is forgiven after watching Simon Pegg and Nick Frost “Swede” this scene from Star Wars: A New Hope. Sure, it is promotional fodder for the upcoming buddy comedy/r-rated version of Alf, Paul, but the Pythonesque feel to this scene is unmistakable. As if to answer the gaming community’s cries for yet another entry in the catalogue of first person shooters set in the current era, THQ and KAOS Studios’ Homefront debuts on PC, XBOX 360 and PS3 today. Although the game is set in the near future, its combat mechanics and elements of the story seem rooted in established gaming and cinematic canon. (That’s my polite way of saying that the game seems as original as remaking Red Dawn with the North Koreans as the bad guys only before plopping the whole thing into the Modern Warfare 2 game engine). To the developers credit, the pre-launch media on their website offers a very creative yet reasonably plausible back story to the game. Let’s hope that the American resistance has a better catch phrase than “Wolverines”. 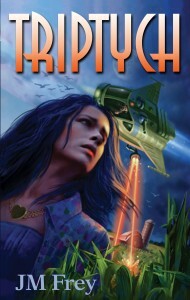 Turning to literary matters, Toronto based author JM Frey is promoting her upcoming novel, Triptych, via social media. Until the book’s launch on April 9th, Frey will be posting one sentence per day on Twitter. Those interested in checking out this preview can follow her at @scifrey or using the #triptych_preview hashtag. Details about the book, as well as a plan to make it #1 on Amazon on April 11th, can be found on the author’s facebook page. Perhaps with a bit of bribery grovelling on my part, I can get JM to come on the podcast and talk about her book. That, meta-humans and normals alike, is your geek news for March 15, 2011. Force be with you and beware the ides of March. No grovelling required! Where and when, Adam? I’m game! Thank you for mentioning the preview!